The Serengeti Boys of Tanzania arrived in Rwanda on Thursday morning ahead of the FERWAFA U-17 Invitational Tournament which starts on Friday, March 29, 2019. The team composed of 24 players and 8 members of coaching staff, arrived in the country at 6am aboard Rwandair from Rwandair. They will be residing at Hill Top Hotel until their departure back to Tanzania on April 5, 2019. The Tanzanian outfit managed by Oscar Mirambo joins Cameroon who also arrived in the country on Wednesday morning. Rwanda’s Junior Wasps who have been in camp since last week takes on Cameroon in the first game on Friday. On April 2, Tanzania and Cameroon will face-off before the tournament ends on April 4 with Rwanda and Tanzania locking horns. 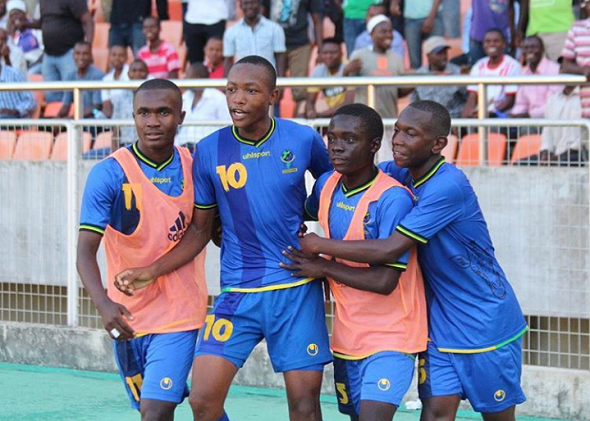 Cameroon and Tanzania will then leave for the CAF U-17 Tournament slated for 14-28 in Dar es Salaam, Tanzania. Tanzania and Cameroon are using the tournament as part and parcel of their preparations for the approaching Under-17 Africa Cup of the Nations (AFCON) slated to take off in the country from April 14th to 28th this year. The Serengeti Boys will be hoping to utilize home advantage to try and win the U-17 Afcon title and also qualify for the U-17 World Cup in Brazil. Serengeti Boys are pooled alongside Uganda, Nigeria and Angola in Group A, while Group B has Senegal, Morocco, Cameroon and Guinea. The best two teams that qualify for the semi finals will directly book a place in the U-17 World Cup to take place in Brazil.